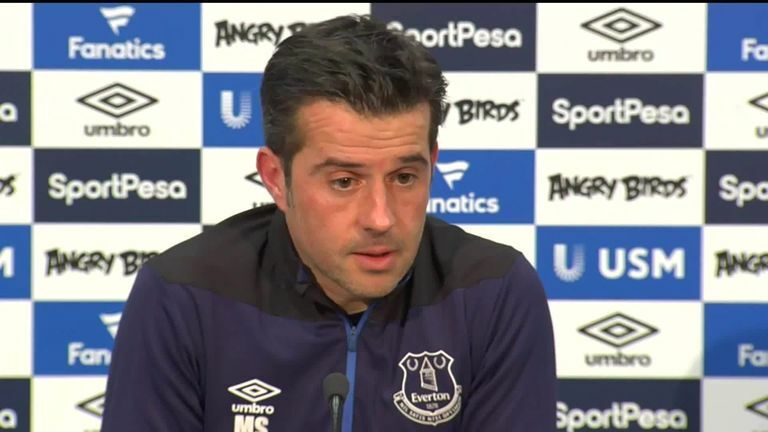 Everton manager Marco Silva says the club need let go of some players in order to make new signings. Marco Silva says Everton are unlikely to reinforce their squad during the January transfer window as the club’s board have informed him that finances are not available for new signings. Oumar Niasse is nearing a move to Cardiff on loan, according to Sky Sports News, with Silva confirming "strong interest" in the striker from their fellow Premier League side. Silva would have Dominic Calvert-Lewin, Cenk Tosun and winger-turned-forward Richarlison as his main options up front should Niasse leave, but the Portuguese does not expect the club to target a replacement. "We don't have the financial conditions to go in the market, [that] is the feedback I have at the moment. I have to find different solutions." Everton are interested in bringing Chelsea's Michy Batshauyi on a permanent deal to Goodison Park, according to Sky sources, but Silva refused to be drawn on a possible move for the Belgium international. "It is not the moment for us to talk about player A, B, C or D [and] if they could interest our model as a team," he said. "We have to work with the players we have here, develop them, let them get better every day. This is our job. "What can happen in the market you know already, what are our possibilities as a club and my possibilities as a manager to do or not." Club captain Phil Jagielka and Morgan Schneiderlin are two senior figures within the Everton squad to have struggled for game time recently under Silva but he insists the experienced duo's future lies under his leadership. Silva revealed centre-back Jagielka, who has made just two appearances this season, picked up an injury earlier in the week, while midfielder Schneiderlin has made nine appearances, all but one of which came before November. "It's here with me - working every day like they are," Silva said of the duo. "Jagielka started playing the first game, Schneiderlin played the first few games. After that it is a matter of performance. "Their future will be here to play again and help us win matches. "It's not just them. If you want I can remember more names. To talk just about both - I understand Jagielka is the captain and Morgan is a senior player - but you're forgetting James McCarthy. "I can just put 18 names in the squad list and I will decide what will be the best solution for us, but if you look to the other squads in the Premier League and they play with two defenders with one on the bench and one out. It is not just us."